November 1, 2018 -- Central and Eastern Europe will be early adopters of "smart" imaging equipment with embedded artificial intelligence (AI) to improve productivity and diagnostic accuracy, according to market expert Simon Harris. The next generation of x-ray equipment with embedded detection algorithms will be able to screen for pneumothorax and other time-sensitive conditions and prioritize these in the radiology worklist, he told AuntMinnieEurope.com in an interview. The first x-ray machines with embedded AI are likely to hit the market in 2019. "We expect to see AI playing a key role in reducing x-ray reject rates caused by incorrect patient positioning or patients moving during the examination. This will not only lead to productivity improvements, but also it will improve the patient experience by eliminating the additional radiation dose from repeat exams," noted Harris, managing director and principal analyst at Signify Research in Cranfield, U.K.
One of the brakes on growth for the general radiography market in Central and Eastern Europe is the chronic shortage in the diagnostic workforce, both radiographers and radiologists, and this problem has been exacerbated over the years due to east-west migration, particularly in new European Union (EU) member states, he added. "Whilst not a cure for the region's radiology workforce shortage, AI has the potential to make a material impact on the quality of radiology services," Harris said. "It is clear that AI will play an increasingly important role in medical imaging in the coming years and the East European region's reputation for embracing new technologies quickly should see it at the forefront of this trend." Flat growth forecasts for the general radiography market in Western Europe means the best opportunities for growth are in the East, although the Eastern European digital radiography (DR) market is heavily influenced by the availability of development funds for healthcare projects, he explained. Any shift of funds away from Central and Eastern Europe to countries like Spain and Greece will have a negative impact on long-term growth prospects. 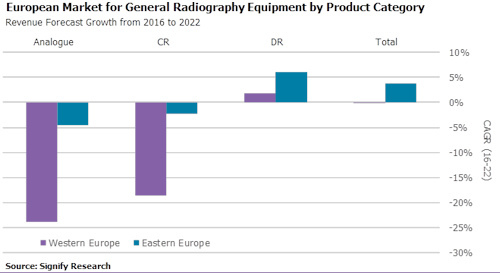 Revenue forecasts for European general radiography equipment, 2016 to 2022. All figures courtesy of Signify Research. The net effect of the expected cuts to EU funding is likely to result in slower growth for the DR market than in previous years, but still at a higher rate than in Western Europe, Harris said. Another relevant point on Western Europe is that a flat market tends to drive quite a significant amount of price pressure, according to Stephen Holloway, principal analyst and company director at Signify. "While it's a big factor -- especially with Asian manufacturers' growing presence -- vendors will also have to work harder on proving ROI (return on investment) with things like workflow/efficiency features, including automatic positioning, user tools, etc.," he commented. Most of Central and Eastern Europe is still serviced by analog or computed radiography (CR) systems, but sales of DR have been increasing, with retrofit kits having a big impact on the market last year. Overall, the number of general radiography systems in use will increase over the next five years, with DR superseding CR technology across the region. Chart showing the transition from computed radiography to digital radiography over time, between Eastern and Western Europe (market revenues). Originally appeared in ECR Today on 4 March 2018. Technology transition. Implementation of governmental incentives and legislation that prioritizes the use of digital x-ray over CR or analog systems has not occurred within Europe, yet. Therefore, the changeover from legacy systems to DR is a more gradual process, with countries such as Romania seen as, until recently, being "not ready" for the transition. This rate of change to DR will be heavily dependent on the price of digital systems. Impact of efficiency gains. As healthcare centers transition from older technology such as CR or analog to DR, productivity and patient throughput will increase. This increased efficiency can result in one DR system replacing a number of older systems, meaning a decline in overall installed systems volume. Increase in system sales factor. Countries such as the Czech Republic are largely skipping CR technology entirely and transitioning from analog x-ray systems straight to Dr. These countries are also improving their healthcare system with new medical centers, increasing the overall size of the x-ray install base. Demand will be increasing for high-end models. Vendors need to harness opportunities for new installations due to increased healthcare spending and improved economic stability in Central and Eastern European countries. However, in markets like Russia, vendors will have to navigate political and legislative hurdles to secure a stake. The year 2018 will be the transition toward digital radiography becoming the prevailing technology across all of Europe, not just the West, according to Signify. "This push toward digital dominance will see an impact on system sales and installed-base, as legacy systems are gradually replaced by DR in Eastern Europe. These emerging markets could just be the antidote to soothe the pain felt by global general radiography vendors in recent years," the firm concluded.